Saturday’s RoC Modified race at Tioga Speedway (NY). If there were any doubts about whether or not Beers was ready to race, they were erased there. He led all 100 laps of the feature and won the event. Before it rained, teams did get the chance to qualify at Stafford and the results weren’t much of a surprise. 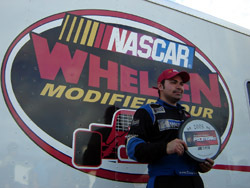 Donny Lia won his second Bud Pole Award in three attempts this season at Stafford. The young New Yorker is now hoping that some of what has been going right in time trials will translate into the races since he is in the middle of a stretch of bad luck. The NASCAR Whelen Modified Tour cheated weather forecasts earlier this season at Stafford Motor Speedway (CT) when they got the Spring Sizzler in after, by many accounts, it should have been washed out completely. This past weekend, the track was not quite as lucky. Friday afternoon, there were few clouds in the sky and the temperatures were in the 70’s. As the sun went down though, dark clouds gathered to the west. Time trials were held, but before the feature could get underway heavy rains and strong winds came through. Track and series officials had no choice but to call off the night’s racing card. The event has been now rescheduled to Sunday, July 3rd. This sets up a long stretch run of Mod racing through the summer. Between this weekend’s race at Riverhead Raceway (NY) and the September 16th event at New Hampshire International Speedway, there will only be one off weekend for the Mod squad. Nobody could rain on Eric Beers’ parade at Stafford though. Beers suffered a broken collarbone and ribs after a crash in the Icebreaker at Thompson back in early April. He missed the Spring Sizzler and has been on the road to recovery ever since. Lia now knows that when he returns to the track on July 3rd, that he will be up near the front. He redrew the seventh position in the redraw and will start the race there. That is unless he gets really lucky and Tour officials redraw once again on raceday. 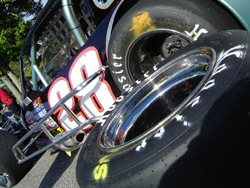 He was back behind the wheel at Stafford and did not appear to miss a beat. He qualified fifth and then redrew the pole position for the race. The most notable driver not to make it in was Rookie of the Year contender Tyler Haydt in the Don King-owned #28 car. Stafford has not been a good track so far in Haydt’s career. He also missed making it into the Spring Sizzler after recording a top ten finish to start out his rookie season in the Icebreaker at Thompson Speedway (CT). Haydt had plenty of company though. The other drivers not making it into the starting lineup for this event at Stafford were Kevin Konopka, Darren Stevens, Steve Whitt, Mike Molleur, Danny Knoll, Wade Cole, Kelly McDougal, Roy Seidel and Jake Morosz. “I was hoping that they might redo the pill draw, but I don’t think that is going to happen,” said Lia with a laugh. On the other end of the spectrum, a few good cars went home early from the Stafford race and won’t be making a return trip to the track over the Fourth of July holiday weekend. In fact, he doesn’t rule out ever trying it himself someday. If Pasteryak ever does giving straightline racing a try, don’t expect it to be in simple bracket racing though. He would have his eye on a funny car or dragster. Former SK Modified regular James Civalli did get into the starting field however. The young driver took a former Ronnie Silk car and qualified for the race in the 21st position. Next to the number on Charlie Pasteryak’s car was an interesting decal. It was a membership decal for NHRA drag racing. As it turns out, Pasteryak is quite a follower of the type of racing. “If I’m going to do it, I’ll do it all the way,” said Pasteryak. Spotted in the pit area at Stafford was a very popular faces that has been absent from the track lately. 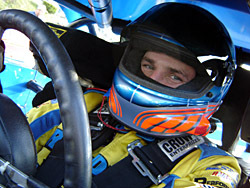 Mike Ewanistko was an interested observer and talked with Speed51.com about his current status and future plans. We’ll have a story on what he told us very shortly. 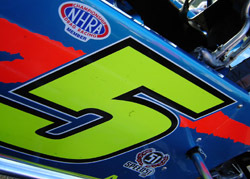 Pasteryak showed his support for the NHRA, and Speed51.com, on his #5. Donny Lia was in a familar place after qualifying.